Anne Quinn Corr teaches basic food preparation at Penn State University in the Nutrition Department and has been cooking professionally for more than thirty years, specializing in gournmet natural foods. Since 1985 she has been a freelance food columnist for the Centre Daily Times. 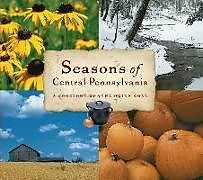 Organized by seasons, this popular cookbook features more than thirty original and adapted recipes in each of its four sections. Photos and vignettes on area cooks, as well as stories about local events and activities, provide additional value to this celebration of Central Pennsylvania's indigenous cuisine. Organized by seasons, this cookbook features more than 30 original and adapted recipes in each of its four sections. Photographs and vignettes on area cooks, as well as stories about local events and activities, are included in this celebration of central Pennsylvania's indigenous cuisine.